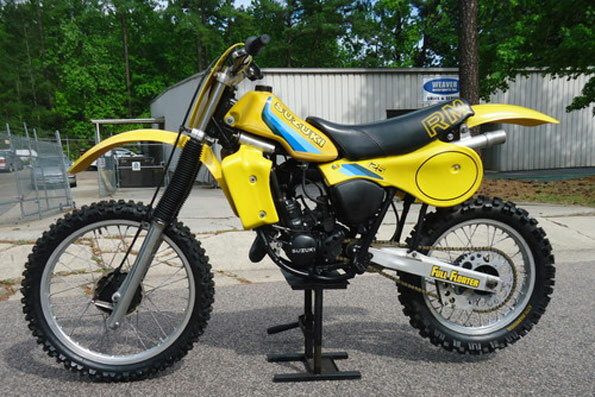 We are excited to offer this very nice 1982 Suzuki RM125 AHRMA vintage racer. We purchased this bike from a collector who was moving some of his bikes out to make room for new arrivals. We have done a nice cosmetic and light mechanical restoration. New plastic kit. New seat cover. Original tank – nice condition. New bars, levers and perches, grips, and gold series chain. Excellent condition stock pipe and decent OEM silencer. New Michelin Tires and tubes. New decals and backgrounds. New front brake shoes. This bike is ready to ride in the Ultima 125 class. Bike runs and shifts excellent and the suspension firm.